The tubes are in and lit, and the amp has a very slight hum--it's very, very quiet. I have no idea what any of this means. I went slow, have good solder joints, no bridges, but I don't know what to do. The fact there is very little drop from A to B is concerning for sure. 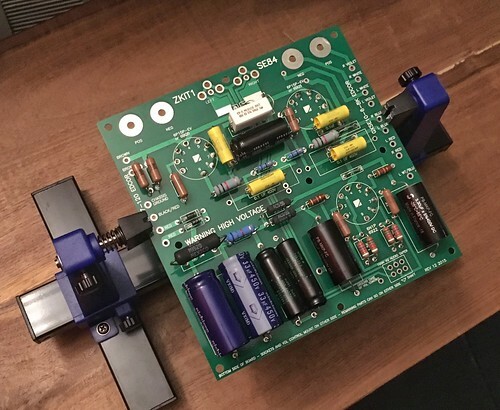 In the schematic I am looking at I do not see test points C and D.
Be very careful around these voltages of course, but measure with the meter on DC both sides of the large 1K 5W resistor. Also, based on where your audio input volume control is turned, points "D" can read zero volts. Turn both of those to approximately the mid point before measuring again. 1) Take your meter, switch it to AC (volts), and measure the heater voltage on all three of your tubes pin 4 to pin 5. You should get 6.3 or so. 2) CAREFULLY measure the line voltage powering your power transformer, you should get 120. This will also prove your meter works and your leads are hooked up correctly. 4) I'd start by finding out why your voltages for D and DD are different. 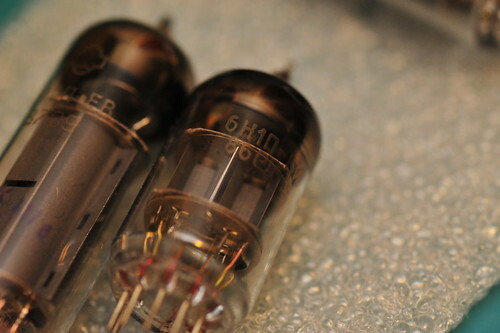 The input tube (6N1P or eq) has two identical halves, one used for the left channel the other for the right. The voltages on 1 and 6 should be the same (around 250), 2 and 7 should be the same (around 0), and 3 and 8 should be the same (around 2.6). If pin 3/8 is higher, pin 1/6 will be lower and if pin 3/8 is lower, pin 1/6 will be higher. Find out whats different thats causing you to get 0 and .62 on pins 3 (D) and 8 (DD). 5) In a similar fashion, the left output tubes pin voltages should match the right output tubes pin voltages. If they don't, find the problem (find out whats different) and fix it. Rookie mistake: I had the wrong tubes in the wrong spots. Corrected. Two talls in the back, a shortie up front. (last night, i had two shorties in back, one tall up front). Also, the amp now squeals at zero volume and gets higher pitched until halfway, then it goes away (or, I can't hear it anymore). Measurements taken after warmed up, volume to half. Tubes are lit up and pretty. TPA at 404 and TPB at 354 is probably ok, it just means your power transformer is a little hotter than the original. TPA at 404 and TPB at 354 is probably ok, it just means your power transformer is a little hotter than the original." DanK, thanks for the reply. I've just returned from vacation, re-read your post, and made new measurements. It is entirely possible--and I wouldn't be surprised or offended--that I'm measuring wrong. I watched some YouTube videos on "how to measure DC." I turned the chassis upside down so that it rests on the power transformer and a cut 2x4. The bottom of the chassis is, right now, exposed so that I can access the board. I put the black lead on the chassis ground and the red lead to the points indicated. These measurements were at volume 0. The amp hums very very quietly, but at volume 0-6'ish, it squeals/whirls very high pitched. At more than 6 volume, it disappears and the amp is very quiet--just the slight, barely audible hum. Can you list the Edcor transformer part #s you used for power and output? 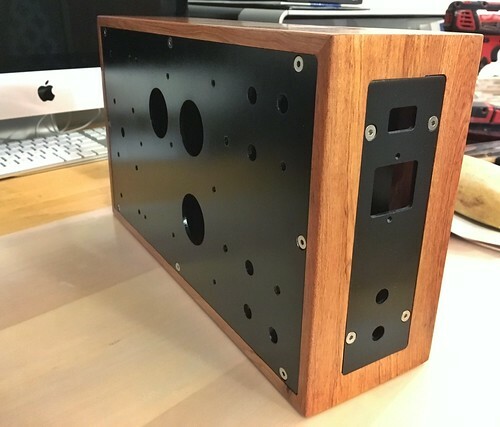 One thing I believe I gleaned from watching the YouTube video of the Zen P-T-P build was to be sure the "case" of the audio taper pot was isolated from the housing. In other words the only place you want any circuitry grounded is either on the circuit board or at a single point on the chassis. 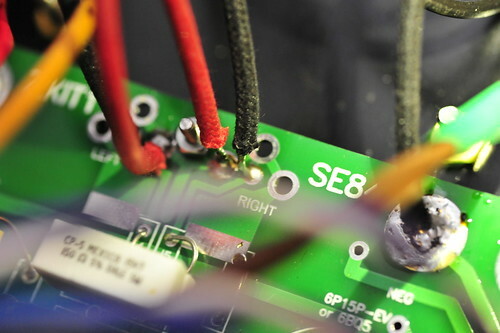 Any circuit that is getting an earth ground connection through any other means than the single point star, creates a good chance for noise (squealing and hum) from a ground loop. It says the volume control case MUST be grounded to the case. It's the input jacks that need the isolation from the case. So be sure the input signal jacks in no way touch the chassis. The high voltages are a bit worrisome since you have the correct power transformer. 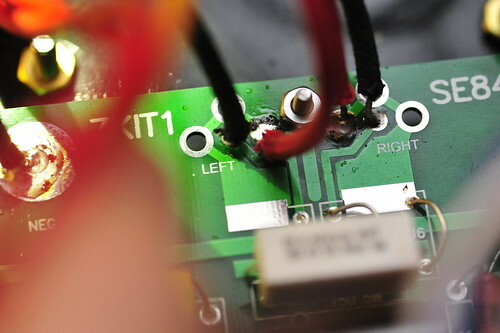 Looking at your layout it looks very neat but I worry if the grounding I mention above is done correct, your squealing could be coming from feedback into the input circuit wiring. 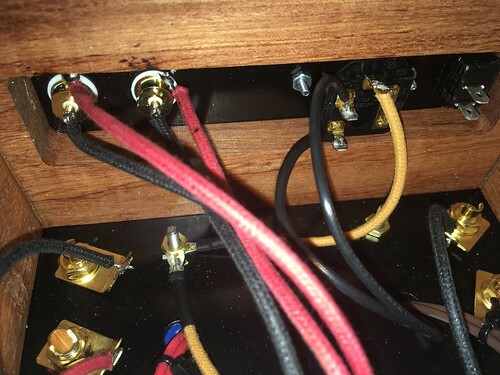 I notice the volume control pot is very close to both output transformers and the wiring to that pot is bundled very close to the output transformer wiring. 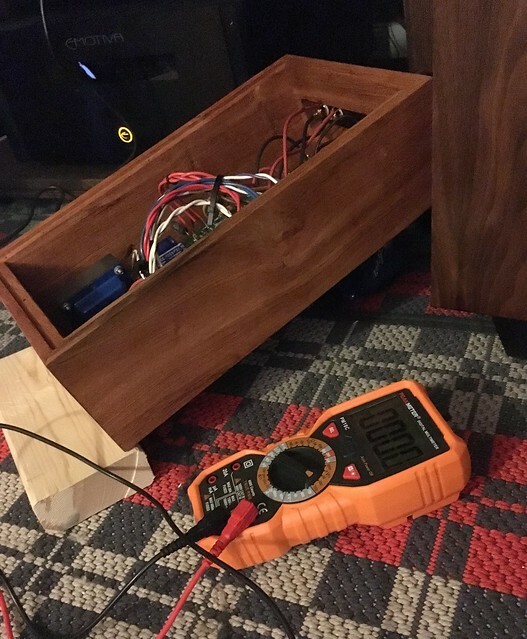 Is there a way to temporarily move the pot wiring away from the transformer wiring? 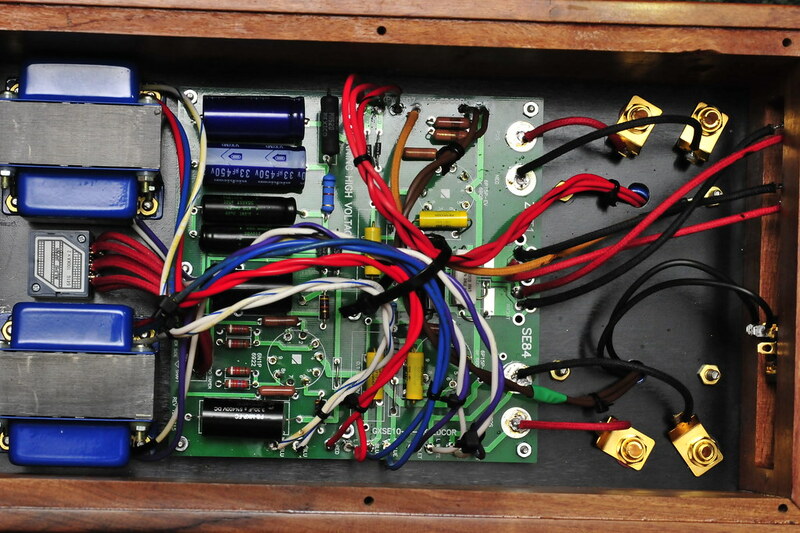 The input tube area is very sensitive to picking up noise since it's a preamp of sorts. Some more pics. 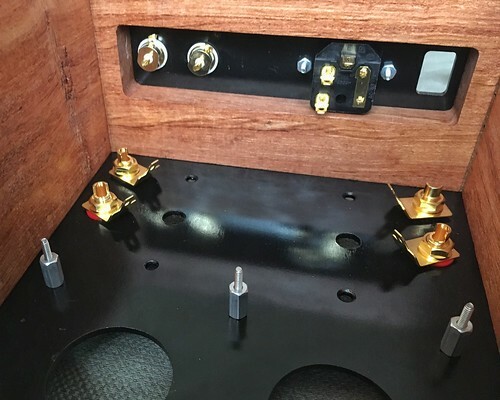 The RCA inputs have a plastic washer on both sides, so they are not touching the chassis back plate. The volume pot uses a metal washer under the metal nut to secure to the top (black) plate. Should this be a plastic washer? 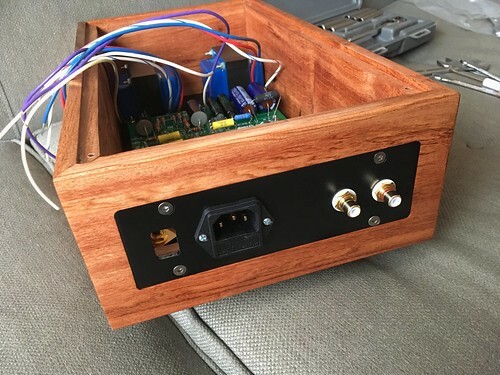 What type of wire did you use between the input jacks and the board and then from the board to the control pot? The Zen video shows shielded cable and that's what I used also. And yes, the plastic insert is how mine is isolated also. The wire is standard hook-up wire, white vinyl/plastic/pvc sheath, and braided nylon. This is the only wire I used, other than that which was supplied by the three transformers. Well I can't say 100% for sure it's where the squealing is coming from but you will pick up quite a bit of noise from all the surrounding wiring and transformers without the shielded cable on the input path. Both ends, near the AC input wiring from the IEC connector and near the output transformers. I'll give it some more thought and try to come up with an idea why your voltages are high. Measures almost like the load is too light. Points A and B depend quite a bit on the loading for their final warmed up value. Don't get disheartened. It's a beautiful build. I also had some squealing and high voltage when I fired up the first one and it took some time to clean it up. Regarding the high voltages, I am looking back at your second post where you mention you had the tubes in the wrong spots. I suppose it's possible one or more of the tubes were damaged. The heaters would still glow fine as the pins for those are the same on both tube types. Are you using the same tube set as you began with, just moved around? Or do you have in a new set that was not part of the "swapped" set? Pin 8 of the tall tubes appears to be unconnected in the datasheets for most varieties of that one so I don't think having 0 volts DC there is an issue. 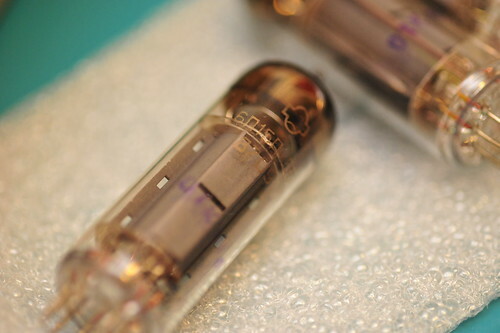 The type of input tube (short one) can vary the voltage seen on pins 3 and 8 so I believe 2.6/3.8 will change by type. What tube are you using there? Your voltage measuring techniques seem fine, Its me that goofed...I meant pin 9 on the tall tubes, not the (no connect) pin 8. Please measure pin 9 on both output tubes. It should be close to what pin 7 is, 350v or so - 435 is too high. With 435 on the plate (pin 7) and screen (pin 9) and with 0 on the control grid (pin 2) and .5 on the anode (pin 3) the tubes should be conducting like crazy. This current should raise the voltage on the anode (pin 3) up to around 10, which will make the tube conduct less. You seem to have all the conditions right to make the tube conduct, but its not conducting, as reflected by the low voltage on pin 3. What tubes are you using? Anyway, the first, front shorty tube seems to be a bit smoky up top compared to the other tubes. The top is definitely darker, and it's not even. Perhaps I did damage it. What are they? They're super cheap. I paid $23 for all six (3x2) including shipping from tubes-store.com. I bought two 6N1P-VI ($4) and four SV83 ($11.80). Shipping was $8. They are Russian. I have no idea brand name. I wanted a working amp before I put good money into tubes (seeing as how I may have already damaged one). All of these measurements were at zero volume. When I plugged the amp in, it made that beautiful almost silent hum. 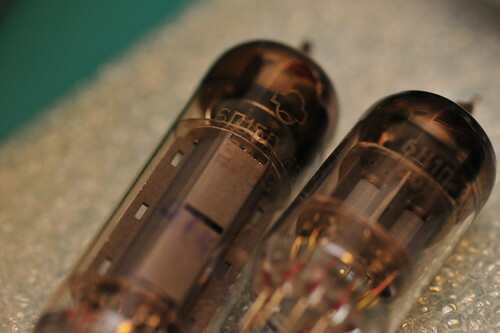 As the tubes took on full brightness, the amp began the high-pitched squeal. The high-pitched squeal goes away when the volume is past the halfway point. Aren't these the tall tube (SV83) measurements? Not "front shorty"? 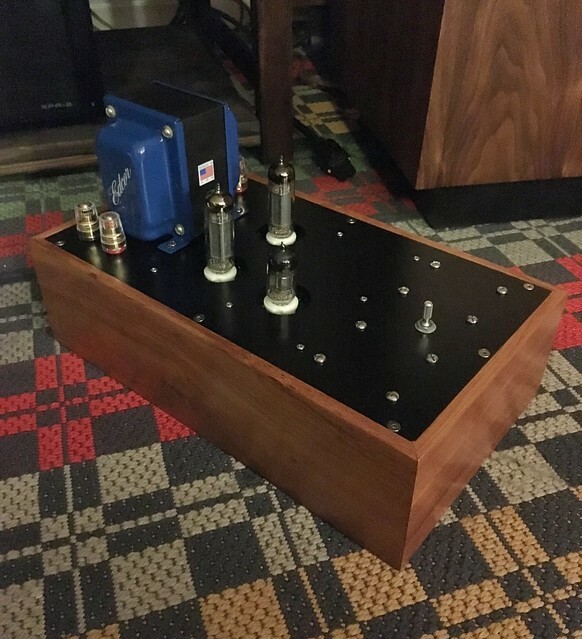 The output power tubes need to be the SV83s and the single short tube needs to be the 6N1P. I think that's what you are doing but be sure as the terminology is getting confusing. The 6N1P measurements (short) look fine, especially since you have the volume at zero when making them. That explains the zero readings at 2 and 7. Once again the pin 7 and 9 voltages on the SV83s look too high. The fact that there is no delta between 7 and 9 on either looks odd and the voltage at 3 on both is too low. I would check the values of the 1K resistors that tie pin 7 to pin 9 and the value of the 150 ohm resistor that ties together pins 3 to ground. Can you measure, DC voltage, with black lead to ground and red lead to point A of the schematic, then point B of the schematic then on the other side of the 1K 6W resistor opposite point A? Again, touch these areas with caution since the voltage is dangerous. Make sure (ohm meter, power off for at least a few minutes) than pin 3 of each SV83 is connected together and to the 150 ohm 6w resistor. Make sure the 150 ohm resistor is 150 ohm (NOT 15 or 150K). Make sure the other side of the 150 ohm is connected to ground. As long as you have the ohm meter out, measure from the SV83's pin 7 to TPA. This should measure the resistance of the primary of the output transformer which should be around a couple hundred ohms (so pin 7 of SV83 to pin 7 of other SV83 should be about 400 ohms). Hope you find something because we are running out of things that it could be. I re-measured the "pre-flight check." I also touched one lead to pin 7 and the other lead to pin 7: 0. The two tall tubes are printed 6N15 and the one short one is 6H15. My order receipt says the four tall ones are SV83 and the two short ones are 6N1P. Turn the amp off, leave off for a minute or two. Put your meter on ohms scale. It its auto ranging there is only one scale, if not select a range around 500 ohms (this means that it will read anything from 0-500 ohms and indicate infinity for anything over that. With your two meter leads free, the meter should read infinite. Each meter has its own way of displaying infinite. Some blank, mine reads "0L." (don't ask me why, I didn't design it). Then touch your meter leads together - you should get 0 ohms. Most meters will read some low value, mine reads "00.4". Now measure the left SV83 pin 7 to the right SV83 pin 7. You are expecting something around 400 ohms (the two output transformer primaries in series). If you get infinite, you should click up to the next higher ohm scale (if your meter isn't auto-ranging). Next, measure the left SV83 pin 3 to the right SV83 pin 3. You are expecting something around 0 ohms. Finally, measure the left SV83 pin 3 to ground. You are expecting something around 150 ohms. Fortunately (or unfortunately) those measurements appear to be correct. Something is up with the pin 3 measurement it seems, voltage wise, even though the resistance looks correct. 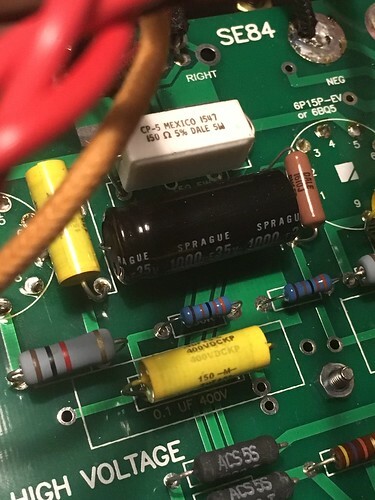 Verify that the 1000uF capacitor across that 150 ohm resistor is indeed the correct value (reading it from the text on the cap body) and that it is turned the correct way with the + side on pin 3 of the output tubes and the - side is going to ground. 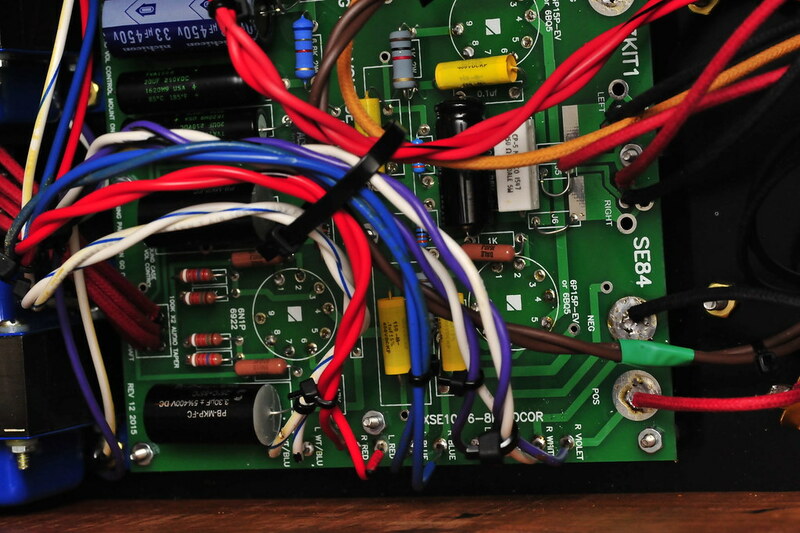 Another thing I notice, and I think it's just a wire color thing, is the wires from the RCA input jacks down to the board. Is black the center conductor color and red the shell conductor? If so then that's ok, just backwards from what I would expect as long as they go to the correct pads on the board. Wow! One thing I do not see in any photos is a connection to the earth ground tab from the IEC connector? Do you have that grounded in some way? That should be a direct connect to the circuit ground screw you have with that single yellow wire to the chassis. At this point I'm going to guess that when you plugged the SV83's in the 6N1P slot you damaged the SV83's. You would have put high voltage on the suppressor grid and zero on the cathode, control grid, and plate. Possibly burning out the suppressor grid. Do you have a set of SV83's that you know never got plugged into the 6N1P socket? Actually you would just need one as the channels could be tested separately to see if that voltage on pin 3 can come up to somewhere between 5 and 10v, indicating normal current flow through the tube. (Just be sure the other channel has a good tube or no tube). With just one SV83 the voltage on pin 3 would be lower, but still way above 1/2v. Everything looks right for tube conduction but there is none. I don't suppose you have a tube tester? (grin). Here is the 150 ohm resistor, and the 1000uf 35v capacitor. Question: in most things I know, black represents - (negative). Here, I have black on + on the PCB (looking at picture, black is left and silver/chrome is right). The four caps on bottom left of the PCB have a + sign on black. Here is the earth ground, added. Re: the SV83s. I pulled out the two I had in there, and put the other two in. It seems they are dead. Most of the pins don't measure, but they do light up. So I put the other two SV83s in and they gave me all the same measurements. Here's to hoping I have some backwards capacitors, as asked about in the post above this? At this point, I'm considering just buying four now EL84s. Probably new 6N1P as well? Got any recommendations, with links? So the capacitor looks in correctly based on the ground side ( - ). The black/red wires at the RCAs are "swapped" per color (in my way of thinking) but they appear to go to the correct board holes. Black on the center of the RCA and that then goes to the signal trace on the board. Red goes to the ground. Now that you have the earth ground tied to the chassis screw, do you still get the squealing? Have you tried putting a signal to the RCAs and a speaker on the outputs? Start with the volume all the way down of course. One thing that was encouraging is that the measurement between A and B now has some delta (50V maybe) which means you have some load going on. The squeal is still present. I have not hooked up yet. I'm afraid. What's the worst that can happen? (seriously, not tongue-in-cheek). If you do not have a speaker hooked up, where is the squeal coming from? And the hum? Uggh. Guess I can't share a video here? Anyway, this second video is where I turn the volume up to slightly past half and the squeal disappears. My ears aren't the greatest but I can barely hear the squeal. Very high frequency I guess. Does it seem to be coming mainly from the output transformers? Seemed like it got clearer the closer you got to those. If you have an old or cheap set of speakers I would hook one up to an output and see if the noise comes through there as well. And if you have an old source you could hook up to the RCAs I think that's pretty safe seeing how the voltages on the input tube looked reasonable. The output tubes is where the biggest problems seem to be so don't hook up any speaker you care a lot about for the test. 4/8/16 ohms are all fine, just start out with the volume at zero. Once I hooked up to my pre-amp and then some cheapie speakers, I didn't hear the squeal. At all. It's silent. I have sound coming from both speakers in equal volume. The gain is way, way lower than my SS amp, but I'm not sure how sensitive these cheapie speakers are. Oh. Also. The volume pot is backwards. It was up full volume. Weird. As for the amp, it's not that hot yet. Very subtle burning dust smell if I get right up next to it. Will continue to monitor. Great! Sometimes a floating input and a floating output can cause strange feedback and noise issues. Probably didn't help at all that the volume was all the way up with no input and the floating earth ground. Swapping the volume around should'nt require a complete rewire. 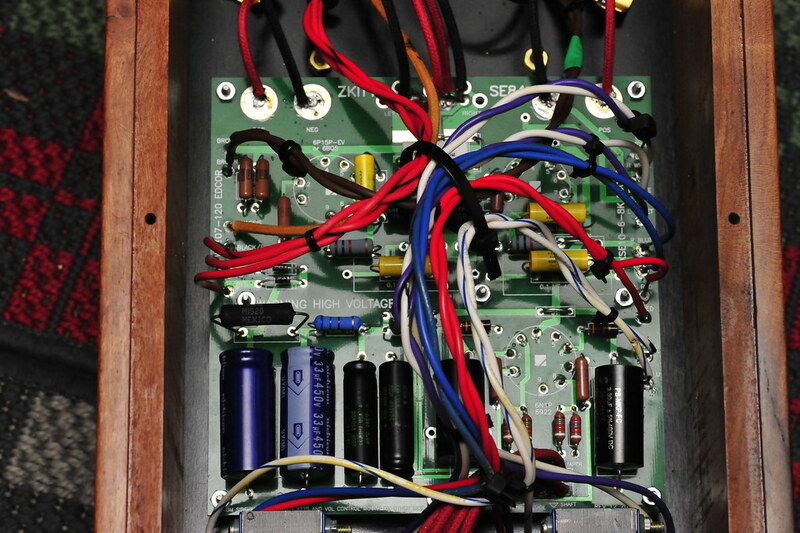 Just moving the two outer wires on each channel at the board and leave the wiper (center)alone. I would re-measure the voltages now with everything connected. Especially pin 3 of the output tubes where you should be getting closer to 10 volts. 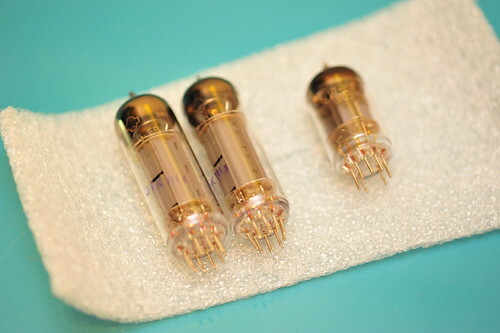 I love my 6P15P (6 "pi" 15 "pi") Russian tubes from Ebay. I've never gotten a bad one. They do take a while to get here though. 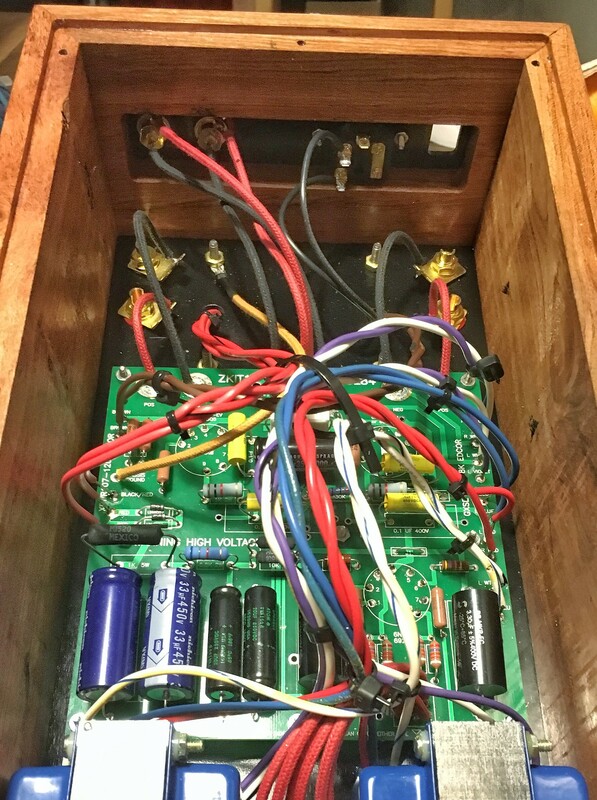 One last thought - put your meter on AC volts and measure sv83 tube pin 4 to pin 5 on both SV83's with the amp turned on. You should get 6.3 vac. If I could figure out how to do it, I would delete this entire thread. I was (am) an idiot. I did not use shielded cable where it was needed. Now that I learned how to use shielded cable, and added extra caps to filter out the hum, my amp is silent and works great. My measurements on A + B are within 8 vdc, and C is within 1 vdc.